R. A. Nemchek presents his views on “overly complex” grinding mill specifications that neglect economics” and are “not clearly focused in the end user’s goals”. The version of the paper we review was published in the proceedings of the SAG2011 Conference held in Vancouver. The title of the paper is similar to the title of the 1970s book “Zen and the Art of Motorcycle Maintenance”, which is itself a play on the earlier book “Zen and the Art of Archery”. A whole series of similarly titled books have been released. The motorcycle maintenance book presents the philosophical concept of Quality that cannot be described in words but is something that must be felt or experienced. It is the parent entity to subjective and objective thought; it is metaphysical unlike the concept of quality we use in manufacturing. Quality in is the most base potential in the universe that pushes everything towards higher levels of Quality. This is a circular definition that makes it a touchy-feely concept that cannot readily be applied to engineering and is even less comprehensible than quantum mechanics in explaining the universe we live in. Zen in the book appears to be about living in the moment, i.e., getting a spiritual experience out of something as mundane as motorcycle maintenance. All this is very good in a fictional book but what does Zen have to do with specification writing? There may be some engineers who undergo a spiritual experience when writing a mill specification but they would be rare. Zen in this paper is more likely to indicate the need for an over-arching philosophical framework in specification writing, e.g., prescriptive vs performance specifications, risk mitigation, have the goal in mind, etc., and if interpreted that way, the paper appears to offer some promise of assisting the mill specification writer. A better understanding of what is important in a mill specification can only be a good thing but does the paper provide value and is it consistent with the owner’s or “end user’s” goals, which are key assessment criteria used in the paper to assess specifications? Mills are a focal point in a plant because they are usually on the critical path of the construction schedule, they represent a single major capital purchase, their availability determines the throughput of the plant and their performance is critical to a project’s financial success. They are not a commodity. They are tailor-made, steel lined, rotating structures for grinding ore. They can weigh more than 2000 tonnes and consume of the order of 30 MW of power continuously. Not only are the mills critical to the success of a process plant but their drives are too. If either a large grinding mill or the ring motor that drives it fails, the costs to the owner in terms of lost production can amount to hundreds of millions of dollars. Grinding mill designs are not all equal – trunnion-mounted mills are very different to shell-mounted mills in both construction and performance. Unfortunately, modern mills do fail despite vendor claims to the contrary. Since the late 2000s there have been partial and catastrophic failures in mills designed using modern technical “industry standards” in Australia, Argentina, Chile and Peru. So what should be the owner’s goals be when purchasing mills? The owner and its agents should be focussed on procuring mills that will (a) grind the required quantity of ore to the size that the process requires and (b) have a probability of failure that is sufficiently low so that it balances or offsets the consequence that a major failure would have on the owner’s business. So, very large mining companies may view a purchase differently from a small or mid-tier miner because the consequences of a failure to each business are different. The owner’s goal reduced to its essence is to manage risk and reward over the life of the project. With this owner’s goal defined, let us assess some points in the Zen of specification writing paper. The paper states that the style of writing is important in developing a good mill specification. It notes that many specifications are amalgamations of many other specifications and that this may result in a disjointed document that has conflicting requirements. It highlights that the bespoke aspect of mills can lead to an overly detailed specification that could be “inscrutable to the reader”. Nemchek observes that the mills are not built by the vendor in their own factories but are sub-contracted out to sub-suppliers and that the lack of direct feedback from the shop floor to the vendor can result mill specifications that are not consistent with modern manufacturing practices but we don’t really understand this logic. Interestingly, Nemchek states that a typical mill specification is approximately 500 pages long! It is clear that a well constructed specification document will make it easier for everyone involved to manage the mill contract but the paper’s approach of simplicity, brevity and clarity in writing are not sufficient to achieve a good specification. The paper does not consider who will write the specification. A good specification requires that writer understands what they are writing and why they are writing it. Thus, an investment is required on the part of the owner or their engineering contractor to train or hire experts who know (a) the capabilities of all the mill vendors in detail; (b) what are the likely pitfalls to be faced with each vendor and each mill type; and (c) how to address these issues in a document. Furthermore, the mill specification is rarely passed on to vendors’ sub-suppliers as stated in the paper. Mill vendors have their own fabrication specifications that they send to their sub-suppliers. What the specification must ensure is that owner requirements that are additional to the requirements in the mill vendor’s standard fabrication specifications are included in the vendor’s specifications as addenda and that these are highlighted and explained to the sub-supplier prior to the commencement of manufacturing. We have never seen a 500 page mill specification but that does not mean they do not exist. The typical, detailed mill technical specifications we have worked with or written are between 50 and 70 pages long including the data sheets. Even the over-the-top specification for the Sept-Iles Expansion was of the about 110 pages, not 500, and this document is quite easy to read and understand. If 500 page technical specifications exist, then they must be rejected by the vendors and the engineering company that wrote these should not be paid for the redrafting. What we have found that is more concerning are 13 page specifications without clause numbering written without any consideration of risk faced by the owner that were developed by the mini-Fluor/Bechtel pretenders that rose to prominence during the mining boom. These are performance specifications that take brevity to a new level. They are a product of EPCM contractors taking a detailed specification and removing anything that could result in any risk to themselves. It was enormously difficult manage these specifications as locating a particular clause involved counting lines on a page rather than referencing clause numbers. You can imagine the frustration this caused when discussing major technical issues by phone or by email with owners, vendors and sub-suppliers on different continents. A further major issue arises in how mill specifications are used by the various parties involved. In particular, the role of commercial managers who have no practical technical knowledge can completely nullify the technical specification with a stroke of a pen. Their need to justify their role by screwing down the vendor’s price is amusing when we have been told by several vendors that they know who these people are and so they increase their initial prices accordingly to provide the win required to clinch the contract. If this is too hard to swallow, consider how many mill vendors lost money or didn’t make super-profits during the mining boom and how many commercial managers were bragging about what a great “discounts” they obtained. Often the discount comes at a price such as relaxed acceptance criteria and the engineer responsible for the mills is left to pick up the pieces whilst the commercial manager dines with the mill vendor, sometimes on the owner’s tab. Writing style is important but not as important as content or the negotiations that precede the letting of the contract. Writing in active rather than passive voice is not going to matter much if the specification neglects to include the requirement for special tools, vibration monitoring systems, lifting lugs, hold-down bolts, etc. The paper states that “a good business deal makes everyone happy” and that a “good specification” is mutually beneficial to the owner, the engineering firm and the vendor. In practice this means that the owner will want a detailed specification that minimises the risk to an appropriate level over the life of the plant. This will include stress levels, mill type, performance, machining requirements, quality acceptance criteria, etc. The engineering company will want to avoid any risk, so they will want a performance specification with little or no technical detail as in the DC 3 example in the paper. The vendor will want no interference by the owner in their processes at all and thus also prefer a minimal specification with justifications such as “trust us; we have done it all before; our mills don’t fail so what are you worried about?”. Prior to 2009, the mantras describing prescriptive specifications as unnecessary from the engineering companies and vendors were hard to refute as there were no “modern mill” failures. Since 2009, there have been a number of failures in large trunnion and shell-mounted mills. Leaving the design and manufacturing details entirely up to the vendor is not a legitimate option for a diligent owner who is obliged to look after their shareholders’ interests when managing risk. Thus a specification is unlikely to be “good” for all of the entities involved in a mill purchase. The paper states that specifications presume an adversarial relationship will exist between the owner and the vendor and that the vendor will “always provide the lowest quality at the highest price”. Well, why would a vendor do anything else? That is how they will maximise their profit, which is their primary goal. This should not be a contentious statement as profit maximisation underpins the whole market economy. The paper is wrong in assuming that goals of all the participants in a mill contract will be aligned. Even worse is that the paper does not consider relative risk. When a mill fails prematurely say 5 or 10 years after commissioning, the engineering contractor will not face any consequence and the vendor will likely be paid to provide replacement components. It is only the owner who is likely to face losses and these can be catastrophic for their business. Furthermore, an adversarial relationship between owner and vendor will usually arise when something goes wrong in the manufacturing or delivery. Even then, it is when the manufacturing fault is foreseeable that friction between the parties will occur. We have not seen any technical specification that presumes such an adversarial relationship apriori. Nemchek states that “mill specifications tend to treat quality requirements as an ointment that, if applied insufficient quantity, will soothe clients. Often, these requirements are written in such a way that the client may add any testing desired, at the supplier’s expense, with acceptance criteria based on the client’s satisfaction”. We have not seen any specifications of this type. The paper goes on to say “[q]uality professionals generally acknowledge that quality cannot be improved by inspecting after the fact. In other words, an out-of-control casting, fabrication or machining process will yield the same results, regardless of how often or how closely it is inspected cannot be improved”. This rings true but it is not meaningful. Consider the casting example below. The casting was presented by the vendor for final inspection and acceptance by the owner. 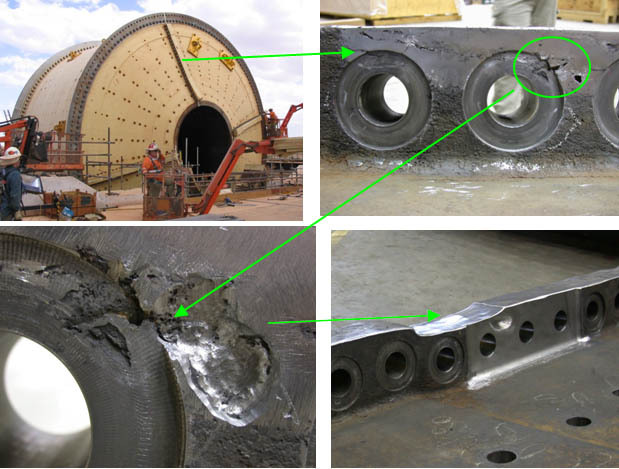 The flaw in the flange would no doubt have resulted in a premature failure had the owner not conducted a detailed inspection to (a) find the flaw and (b) insist that the criticality of the flaw be investigated by grinding. The repair, whilst unsightly, was far more preferable than a broken head. 3 – Who pays for Quality? Nemchek states that some specifications have open ended quality criteria and these can result in testing being added at the vendor’s expense. Whilst this may occur, we have not seen it. Our experience is that owners, their agents and the vendors all have the opportunity to come to an agreed specification prior to an offer being made final by the vendor and accepted by the owner. This includes all the testing required to assess mill components. Mill vendors are not babes in the woods when it comes to understanding their exposure. However, once a component is found to be outside the agreed specification acceptance criteria, shouldn’t the owner have the right to insist on additional testing and/or compensation before accepting the component? It seems only fair. What often happens during mill manufacturing is that vendors shift the goal posts by claiming that the faulty component is “fit-for-purpose” and so do not reject the component. This becomes an issue that cannot always be resolved technically. The solution is to have a project manager with a backbone and a contract that gives them the power to influence the process when things go wrong and to direct changes if necessary. It should be noted that fitness-for-purpose means different things to different people. The cars below both provide transportation for four adults. If the number of adults were the only criterion, then both vehicles would be fit-for-purpose but which one would you buy? This is a well written section. The mill vendor’s buy-in to the process is critical to the success of the project. However, it is important to be aware that a mill vendor will not be and possibly cannot be as open in their tender as the owner requires. Mill vendors often provide a list of potential sub-suppliers for a component and include the rider “or equal”. There are not many foundries that are “equal” to Ferry Capitain, Siempelkamp or Sidenor. Similarly, all fabricators are not equal. The owner’s team must ensure that the sub-suppliers chosen by the vendor are capable of delivering components that meet the owner’s requirements. This is often neglected in tender negotiations. CONCLUSION: Is “Zen and the Art of Specification Writing” Valuable? The paper presents an approach to improving specifications for grinding mills. Its focus on a holistic approach to specification writing is worthy but the paper does not consider the mill procurement process in sufficient detail in reaching its conclusions. A substantial part of the paper is devoted to grammatical issues such as active and passive voice, simplicity, brevity and clarity. It includes a “Miranda warning” twice in the paper, i.e., “anything the specification writer says can and will be used against them”. This is inconsistent with the paper’s criticism that current mill specifications presume the relationship between the owner and the vendor will be adversarial. The paper discusses too little or too much detail being included in the specification but it does not indicate what details are important. It does not consider the relative risks that the parties involved in the process face. Its take on quality is quite naive as shown in the casting photos in this post. Like the novel, Zen and the Art of Motorcycle Maintenance, the paper is an attempt to transcend the classical approach (philosophy) of specification writing (motorcycle maintenance) rather than providing practical examples of what is needed and any benefit the reader gains from the paper (book) depends on the reader’s predisposition to self-analysis. As a tool for improvement of all mill specifications, the value of the paper as it was published in 2011 is likely to be similar to the limited effect that the “Zen and the Art of . . . ” books have on improving the overall psychological well-being of western society. Possibly the greatest omission in the paper is the lack of comment on the Scope of Work. This is the most important part of the specification. If the scope is wrong then any further effort in writing the specification or fostering good relationships with the vendors or testing the mill components will be wasted. This could be included in the paper philosophically as “putting first things first”. Our contribution to the “Zen” of specification writing would be this. If you are starting a new specification, then some of the most relevant and useful spiritual experiences you can have are found during commissioning of mills out in the desert in summer or repairing mills late in the night in freezing conditions. These experiences will increase your desire to learn as much as you can on the technical, commercial and managerial aspects of the mill procurement process. They will improve your mill specification immensely.